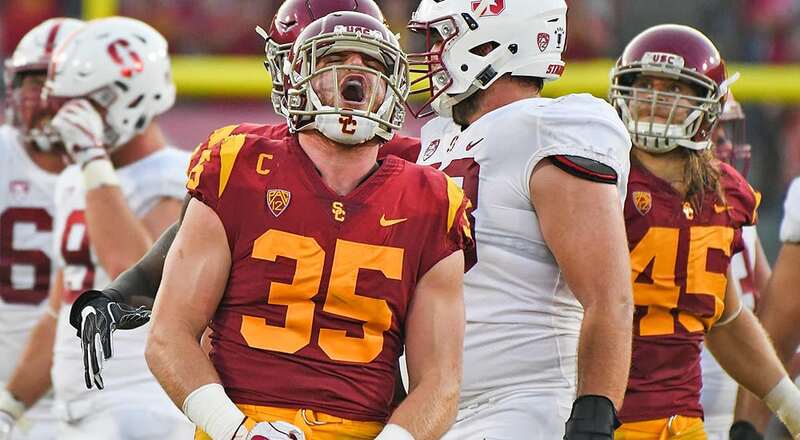 Senior linebacker Cameron Smith leads the USC defense with 16 tackles and three tackles for loss through the Trojans' first two games (photo courtesy of usctrojans.com). While every Texas fan wants the Longhorns to win each and every time they step on the field, the importance of Saturday’s matchup between the Texas Longhorns and USC Trojans is a matter of some debate. Some would argue that losing to Maryland in back-to-back season openers has ratcheted up the pressure on the Longhorns to win … soon … while others have preached patience, trust in the process, etc., as head coach Tom Herman and his staff continue teaching their systems and recruit the players they think will best fit what they are teaching on both sides of the ball. The game against USC (1-1) is not a must-win for the Longhorns. If they lose to the Trojans and then run the table, it would be difficult to find a UT fan who wouldn’t declare the season a huge success. That being said, however, a victory Saturday over a marquee program like USC would go a long way toward building the confidence of the Texas team and its fans that the Longhorns can play compete with and even beat anyone on their schedule. So what is known about the team venturing into Austin? • Quarterback JT Daniels makes this the ideal time for Texas to face UT. The hype surrounding Daniels has been enormous since he committed to play for the Trojans, and with good reason. Daniels graduated from powerhouse Mater Dei a year early to enroll at USC with a lengthy list of accolades, including: Gatorade National Player of the Year, MaxPreps National Player of the Year, National High School Coaches Association Player of the Year, USA Today All-USA first team, PrepStar Dream Team, Orange County Register Fab 15 first team, Tacoma News Tribune Western 100, Gatorade California Player of the Year, USA Today All-California Player of the Year, Cal-Hi Sports State Player of the Year, Cal-Hi Sports All-State first team, MaxPreps Junior All-American first team, All-CIF Division 1 Offensive Player of the Year, Los Angeles Times All-Area Player of the Year and Orange County Register All-Orange County Offensive Player of the Year. In his junior — and final — season at Mater Dei, Daniels completed 262 of 365 passes (71.8 percent) for 4,123 yards with 52 touchdowns and only four interceptions, and ran for 561 yards on 63 carries (8.9 yards per carry) with nine touchdowns. Mater Dei went 15-0 in 2017, won the California CIF Division 1 title and the California State Open Division crown and was named the prep national champions. If there is a young quarterback who deserved the hype, he’s it, and quickly earned comparisons to such Trojan luminaries as Sam Darnold, Mark Sanchez, Matt Leinart and Carson Palmer. But he is still a freshman — a freshman who should be a senior in high school — and that means there is a learning curve that comes with the maturation process. Through USC’s first two games, a 43-21 victory over UNLV and a 17-3 loss to Stanford, Daniels has been OK — nowhere near the program-saving hero some expect him to be, and that doesn’t mean he can’t become that player. But he’s not there yet, having completed 37 of 69 passes (53.6 percent) for 497 yards, two interceptions and a touchdown. He has shown flashes of eye-popping talent, but he still is learning and working to be more consistent. In addition to his talent, the SC coaches rave about his intelligence, which provides ample evidence that he could be a quick learner who accelerates his learning curve. Now is the time to face the Trojans, before he becomes the player the Trojans and their fans hope he will. He doesn’t move around in the pocket as well as Darnold did, and he certainly has not mastered the offense to the extent that the New York Jets’ starting quarterback did, and he basically never got hit in high school. If the Texas defense can get to the precocious passer early, maybe he can be rattled. • If head coach Clay Helton comes across as a little vanilla in interviews and in his play calling, he comes by it honestly: his father, Kim Helton, was the same way as a coach. The elder Helton coached for 40 years in both the college and professional ranks, most recently as the offensive coordinator at Alabama-Birmingham from 2007-11. That doesn’t mean he can’t coach, but anyone looking for one of those coaches who stomps up and down the sideline, screaming at officials and gnawing on his play sheet is going to be disappointed. • Wide receiver Keyshawn Young answers to the nickname “PIE,” and that’s not a reference to the redshirt sophomore’s eating habits. Instead, the moniker is a result of his late grandmother’s desire for him to be “Perfect In Everything” … which led to the “PIE” acronym. • Through two games, the SC offense has gotten more yards through the air than on the ground, but reached the end zone more often on the ground. The Trojans have racked up exactly 500 passing yards to go along with Daniels’ single touchdown pass. The ground game, led by Aca’Cedric Ware (28 carries for 159 yards and a touchdown) and Stephen Carr (19 for 106 yards), has racked up 390 yards and three trips into the end zone. • The SC defense has generated three takeaways in the first two games, with a pair of interceptions and recovering one of two forced fumbles, and has collected five sacks. The Longhorns would do well to steer clear of (or at least keep an eye out for) Cameron Smith, the Trojans’ bulky (6-2, 250 pounds) inside linebacker who leads the SC defense with 16 tackles in two games. Smith looks too bulky to be a smooth athlete, but he runs well and can be an absolutely violent hitter. He has a sack and a team-high three tackles for loss, but he is not limited to just rushing the passer and plowing into the backfield; Smith also is an able pass defender, with two passes broken up in the Trojans’ first two games.